So far Phil Wright has created 13 blog entries. “You’ve got a what? !” said my ex-wife and daughter in unison. My son was even blunter: “Why are you reviewing obsolete technology?”. The object of their ire – Gold Note’s new CD player, the CD-1000 MKII. Did they have a point? Boom, boom, boom, boom! A dCS factory tour! Ben Ashcroft (pictured above) – he’s head of dCS’s service department and he’s deep into techno music. He’s still smiling too, despite the ‘help’ provided by Andy McHaig, dCS Technical Director. When Ben first joined the company as an apprentice he was tasked with developing a ladder DAC (dCS make DACs). McHaig assisted Ashcroft hard-wiring some of Ashcroft’s beloved techno into the logic board to expedite listening tests. How thoughtful. Comments Off on Boom, boom, boom, boom! A dCS factory tour! Brit restraint alert: I was somewhat taken with the LS6 speakers from Graham Audio. The design principles behind them swim against the tide. It’s simple – the cabinets are supposed to vibrate. Forget Fort Knox solidity, forget 25mm side walls. Say hello to thin cabinet walls that oscillate with the music. The trick is in the cabinet damping and bracing. It shifts resonances out of the way, leaving a natural tone. With skilled design, the thin-wall approach works well. Mytek’s Liberty DAC (£895, $995, €995) was reviewed by me (here) and put in a stellar performance, more than holding its own in the company of an Ayre AX-7e (£2,750) and Harbeth C7/2 speakers. Little bro just got a bigger bro, for to kick the sand back at the sceptics. “Roon. Great functionality, metadata2die4, a user interface that trounces others Hulk-style. All for the price of a good interconnect. Or rent it, like your music.”…say some. It’s not the only party in town though. I use it. I know it’s good. It does cost a fair wedge and Roon’s in-house coded RAAT protocol is theirs and theirs only. I’m two years in and things move on both inside Roon (via a wealth of updates) but also elsewhere. Heresy: “Opinion profoundly at odds with what is generally accepted”. Klipsch got that right. 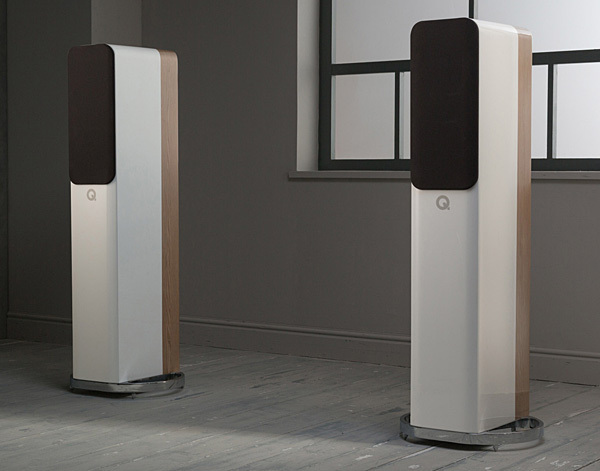 The Heresy III are not your average floorstanders, in looks or in sound. Short and squat in stature, two well-tailored Ewoks ready to do your bidding. Technology – horn-loaded drivers – from a bygone era. Specs that underwhelm (-4dB at 58 Hz?!). And, dare I say it, a sound that falls short 10% of the time. It’s all in the hyphen. ● Super integrated; a nice amplifier. ● Super-integrated; an all-in-one – amplifier / DAC / streamer / phono stage in one box. The music centre reinvented. The second bullet refers to the audio industry’s response to real-world listening rooms. Spaces that are shared. Where books, furniture, TVs and a plethora of other things have equal footing with audio hardware. Where a forest of kit just doesn’t work. Half the size, half the functionality, half the price. Sort of – bear with me. Does the Mytek Liberty DAC (preview here) deliver half the sound quality of the Brooklyn DAC (review here) and Brooklyn+ DAC (review here) on which its design was based?